LET IT BE...NAKED or "How NOT to do a Beatles album!" Rock 'N Roll Case Study: LET IT BE...NAKED or "How NOT to do a Beatles album!" More than a year ago, we covered the lost Beatles GET BACK album. Rumors were just starting to circulate about the release of a de-Spectorized LET IT BE. (put link here) Ringo explained that the new album would be "the de-Spectorized version. Cleaned up a little. Same tracks, same people." However, Beatle experts pointed out, LET IT BE and GET BACK were two different albums - although some tracks overlapped, there were a few that were exclusive to each. Would this be a case of "Beatles revisionalism"? Right: In case you were curious, this is what the LET IT BE...NAKED cover looks like when reversed from its photo negative. The Rutles spoofed the LET IT BE project perfectly when they said that their LET IT ROT album was released as "an album, a film and a lawsuit". The GET BACK/LET IT BE sessions were not happy times in Beatles-land. George Harrison later described the Get Back sessions as "the low of all time". John Lennon agreed, describing them as, "Hell.. the most miserable sessions of all time". What had started at Paul's idea to rejuvenate the group and "get back" to their roots came close to splitting up the band for good. Although Glyn Johns mixed two versions of the album, it remained unreleased. That is, until Allen Klein brought in Phil Spector into the project in 1970. When Spector's version of the album was released, Paul McCartney HATED it, especially Spector's addition of strings and choirs to "The Long and Winding Road". In McCartney's opinion, Spector was the devil-incarnate, having messed with the integrity of his songs. Well, more than 30 years later, McCartney finally got his way. 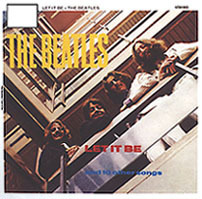 On January 31, 2003 it was officially reported that the un-Spectorized version of "Let It Be" would be released in the fall of 2003. 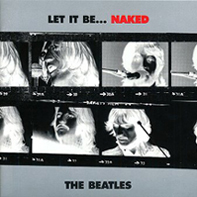 The basic premise was the un-Spectorized version of the album, hence the title LET IT BE...NAKED. The stripped down LET IT BE project had been underway for at least two years, with George Harrison giving his approval before his death in 2001. It sounded good...in theory. Beatles fans like myself were elated. Maybe now we would finally get the GET BACK album. 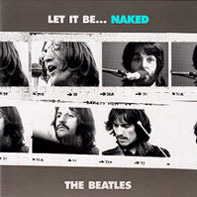 When the album ultimately appeared, it was titled, LET IT BE...NAKED. No, it wasn't the GET BACK album, but rather a completely new creation. That's were I take exception, as this reeks of Beatles-revisionalism at it's worst. Instead of a promise of redemption of a neglected area of Beatles history - you get a crappy, manufactured album with an even crappier cover. My major beef with the 'new' Beatles CD is that is not the "un-Spectorized" version of the album as claimed and that it is not "naked" as the title infers. If these claims were true, you would be holding an official CD of the original GET BACK. 'Naked' is defined as "Being without addition, concealment, disguise, or embellishment". Following this definition, you have 'concealment' in the fact that all the informal talk between tracks was removed. When you strip away the ad-libs, talk between takes and brief jams - you take away essentially the core of the GET BACK album. It WAS intended to be informal, or as Lennon called it, "Warts and all". You get 'embellishment' in the fact that the tracks were remixed and in some cases two takes were combined to make a 'new' version ("Don't Let Me Down"). And there is a new running order - if you were essentially issuing the same album, sans Spector, wouldn't it have made sense to have the same running order? In the end, they get around the GET BACK issue totally by calling it "LET IT BE"...NAKED, inferring that the CD is McCartney's view of what LET IT BE should have been in the first place. What is most ironic about this 'McCartney showcase' is that John Lennon shines the best with the minimalist treatment of his 1968 song, 'Across The Universe'. This song alone is the saving grace of this whole CD. The new mix features only Lennon's voice and guitar, with Harrison on tamboura and Starr on a bass drum. None of the animal effects/female voices of the "Wildlife Version" and none of Spector's smothering strings that were on the original LET IT BE version. This is the only track of the album that is truly "naked". It is interesting if you recall John's 1980 comments on the song: "The Beatles didn't make a good record of 'Across the Universe.' We would spend hours doing little, detailed cleaning up on Paul's songs, but when it came to mine... especially a great song like 'Across the Universe' ...somehow an atmosphere of looseness and experimentation would come up. The song was never done properly. The words stand, luckily." The extra disc of "Fly On The Wall" outtakes from the January 1969 sessions is totally worthless - simply a ploy to 'double' sales I reckon. At least it does contain "Maggie May" and "Dig It" from the 1970 LP. I'm not saying that this is a bad album - just bad by Beatles standards. While it is interesting hearing some of the new mixes and hearing some instruments brought forward, the LET IT BE...NAKED CD will not replace the original LET IT BE on my home listening Beatles play list. III. WHAT ABOUT THAT AWFUL COVER? Apple missed a golden opportunity by using a shoddy cover for LET IT BE...NAKED. Instead of using the original GET BACK cover that was to adorn the original album, they simply used photo negatives slapped on a silver album cover. One can almost hear John Lennon's 1971 quote: "what happened to my idea of putting the parody of our first album cover on the Let It Be cover?" I came across a perfect cover idea whilst searching the Internet on GET BACK/LET IT BE. 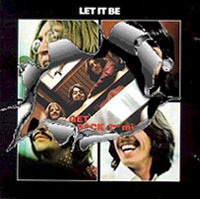 At the Beatles on Abbey Road website is an image of LET IT BE being torn away to reveal the GET BACK ALBUM underneath. Why didn't Apple this clever? IV. WHAT WOULD HAVE WORKED BETTER? There are two very important parts of Paul's GET BACK idea: recording an album like they used to without studio gimmicks and overdubs AND playing live again. Using these two McCartney premises, you would have had the perfect recipe for a great album by simply using the Glyn Johns mix of GET BACK. My only change to this lineup would be to add "Across the Universe" and "I Me Mine". Using this lineup, not only do you have "Let It Be" and "The Long and Winding Road" in their 'naked' form, but also some different takes from the LET IT BE album. Luckily, I have the bootleg vinyl version of the GET BACK album (in glorious stereo-unlike many of the '70s vinyl GET BACK boots), complete with the original parody album cover. Playing this vinyl album back to back with LET IT BE...NAKED was what originally inspired me to write this article! LET IT BE...NAKED just pales in comparison. Oh, and what about a "bonus disc"? Why not a complete recording of the 'rooftop concert' that served as a finale for the LET IT BE film? The 11 songs performed on that January '69 are a great historical record of the Beatles very last live performance. There, I've said it - What I don't like about LET IT BE...NAKED and what I personally would have released. Not that it makes much difference, ha ha. Right: The next "NAKED" album by Apple? V. THE FUTURE OF BEATLES ALBUMS? It will be interesting to see what "new phase Beatles albums" that Apple will come up with in the future? Hmmmmm...past albums have included: "Love Songs", "Reel Music", "Let It Be...Naked", etc. Why not continue with these insipid themes by having Apple re-release the Hamburg Tapes? THE HAMBURG TAPES...NAKED - with all German crowd noises and all in between banter by the Beatles taken out?